Good job ATK! THIS Cygnus sure is a sweet ride. Larger and more cargo than ever! Can’t wait to see the science that comes back from this mission… fitting as afterall, it is Earth Day! We really should inaugurate a ‘Space Day’ to commemorate all the hard work and risks taken by the astronauts aboard the iSS! AND for everyone who have put their hearts and souls into mankind’s progress and expansion into space… including you Ken! Space Day takes place on the 1st Friday of the month of May. This year(2017), it falls on May 5th. You are so right BC! I note that this day is ‘unofficial’ . It should be made more well known by becoming ‘officical’… we owe so much to the satellite’s that monitor the weather, send our messages and protect our shores! The question that has yet to be answered is why NASA wanted this Cygnus boosted by the Atlas V rather than the Antares 230. The difference in payload is not great (3,500 kg (7,700 lb) for the Atlas V or 3,200 kg (7,100 lb) on Antares 230). The cost difference while not advertised it presumably is significant. 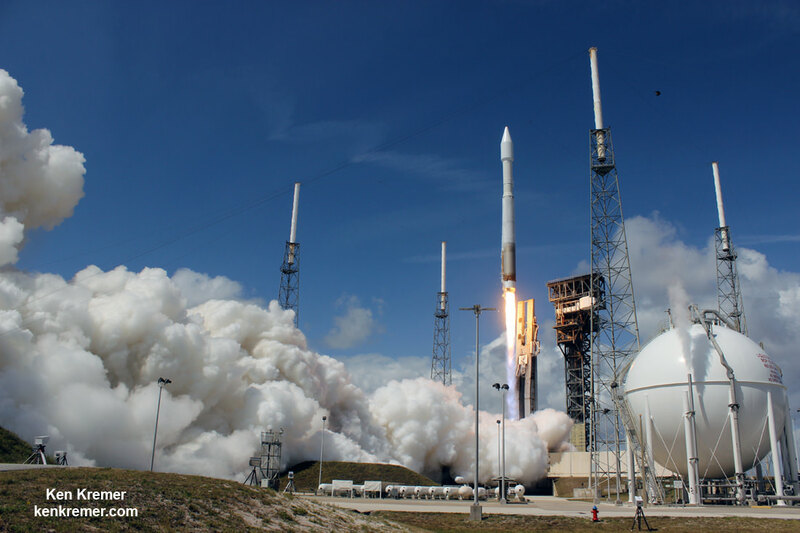 The Atlas V is not an inexpensive rocket ($100 million). The price to launch the Antares 230 is not available but probably less than $100 million. I wonder how much was 600 lbs was worth to NASA.